See more objects with the tag container, science, experimentation, future, glass, experimental materials, 3D printing, vessel, clear, emergent. This is a Vessel. 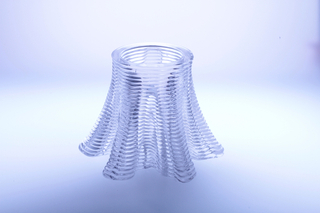 It was designed by Neri Oxman and MIT Media Lab Mediated Matter Group. It is dated 2015 and we acquired it in 2016. 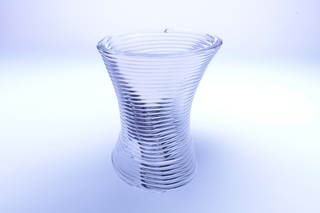 Its medium is 3d-printed glass. It is a part of the Product Design and Decorative Arts department. 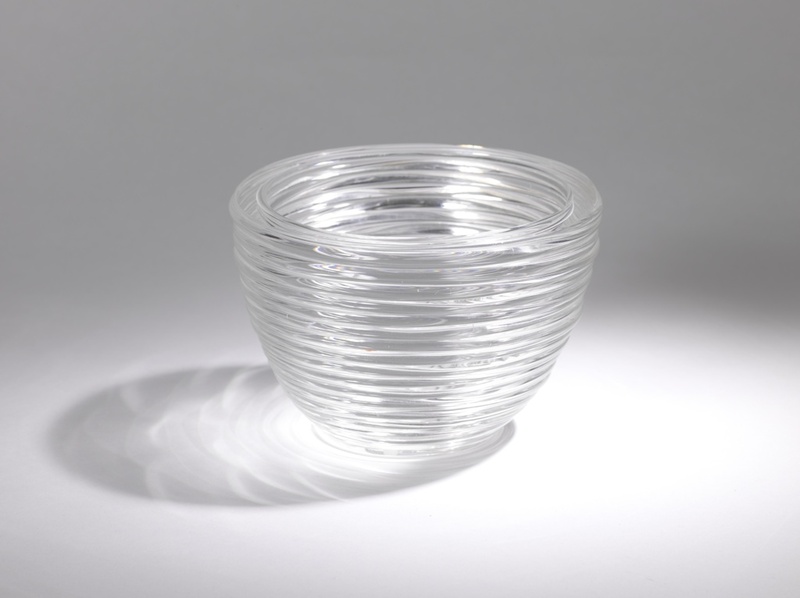 This vessel prototype from the GLASS series is one of four sought for acquisition by Cooper Hewitt. 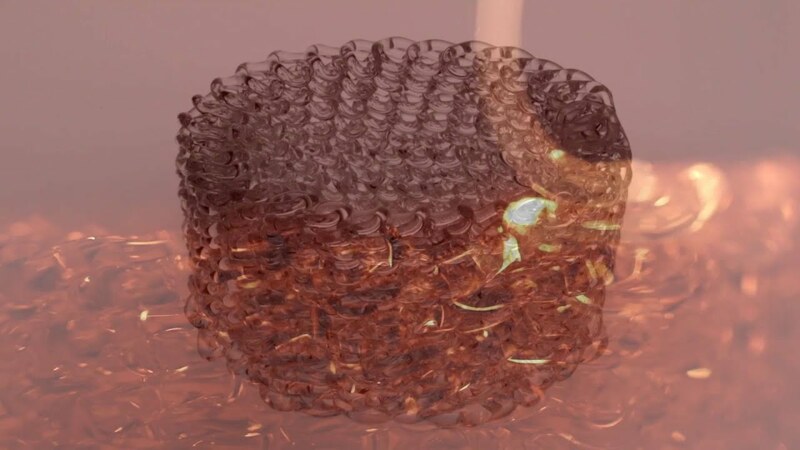 It is among the first products of a new method for creating glass structures with additive manufacturing technology (also called 3D printing), developed by Neri Oxman and MIT Media Lab’s Mediated Matter group. 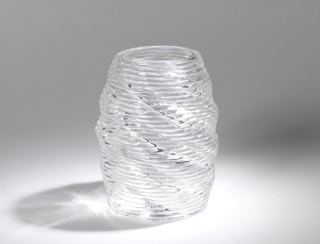 The technique was unveiled by Oxman and her Mediated Matter group in September, 2015.The platform, known as G3DP (Glass 3D Printing), is the first-of-its-kind glass printing process, which extrudes molten glass layer by layer to yield optically transparent structures. 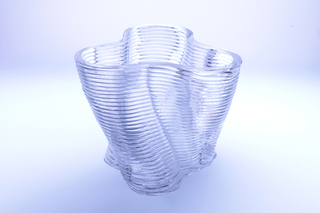 By leveraging the extrusion process, Oxman and her team develop glass products that are mechanically more robust, optically tunable, and structurally customizable than those manufactured through glass sintering or selective laser melting, other 3D printing methods used for glass. Each piece in the series is built up from tubes of molten glass, layer by layer, yielding optically transparent structures. 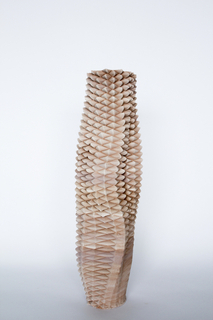 The designers varied the printing times and temperatures in creating different structures. This object was purchased from MIT Media Lab and fund: General Acquisitions Endowment. It is credited Museum purchase from General Acquisitions Endowment Fund and through gift of MIT Media Lab. 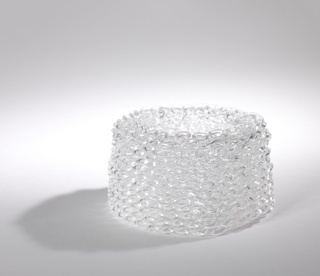 We have 1 video that features DR.01, from GLASS series Vessel, 2015.